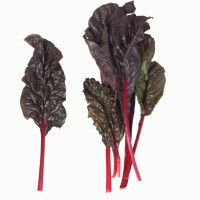 Home » Recipes » Appetizers » Swiss Chard – A Tasty Leafy Green Your Family will Enjoy! It’s hard to get enough greens in my family’s diet. So we rely on Swiss chard , a family favorite, and a frequent go-to veggie. It’s a super food that’s jam-packed with nutrients, phytochemicals, it’s easy to grow, and tastes great. One Swiss chard plant in an old whiskey barrel produced tasty leaves for an entire year! Periodically, trim at the base, and it will keep growing. Swiss chard is a vegetable that tastes fantastic super fresh – so try to buy it fresh at the farmer’s market. How to Prepare this Tasty Veggie! Chop a few garlic cloves and set aside. Kids can press and peel the garlic. This allows for the allicin, a phytochemical in the garlic to activate its health benefits. Wash the Swiss chard thoroughly -have the kids help! You can fill a bowl with water, swirl the leaves around, and then rinse them in a strainer. Don’t dry the leaves. Chop the leaves horizontally into 1 inch strips. Place garlic and olive oil in a large pan on the stovetop and cook on low-heat for two minutes. Place the Swiss chard in the pan directly from the strainer, the extra water will help cut down on the need for more oil and help steam the leaves. Add an extra tablespoon of water, if needed. Cook covered over medium heat for 3-5 minutes, occasionally tossing. Leaves should be bright (not dull) when finished, a sign they have not been over-cooked. Eat and Enjoy! Check this easy handout for more tips on cooking with kids! Comment on Swiss Chard – A Tasty Leafy Green Your Family will Enjoy!